I’ve always enjoyed the changing of the seasons. The arrival of fall and winter are both something I look forward to with genuine anticipation, and, even though those seasons bring with them of a lot of inclement weather, it doesn’t bother me in the least. Snow days at school were always the days where I could spend the whole day at my drawing board working on cartoons, and, likewise, rainy days on fall weekends usually freed me up to do the same. 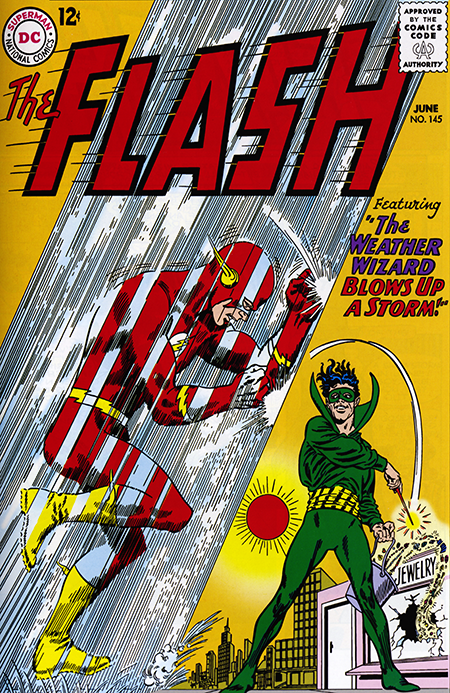 Which probably explains why I’ve always had a soft spot for the Weather Wizard. The hook in The Weather Wizard Blows up a Storm revolves around a young boy’s science fair experiment which predicts snow in the middle of the summer. The boy, Tommy, continues to stick to his guns in the face of ridicule by classmates and adults. The Weather Wizard hasn’t been seen since issue #130 and, although he escapes from jail, he probably could have gotten out on parole given how long it’s been since we last saw him. When the WW cooks up a snow storm to help him rob a jewelry store, Iris, who was covering the science fair, points out to the Flash that Tommy had predicated it. The Flash teams up with him to figure out when the WW is about to commit a crime. After some foiled attempts, the Flash eventually prevails and captures the wily weather wreaking wonder (that was fun). And, of course, Tommy wins the science fair and gets the scholarship money. In the second story, a female scientist, Doralla, from a super fast dimension arrives on Earth. In order to be seen, she has to deliberately slow herself down, which we later learn is the cause of a number of explosions that occur around Central City. 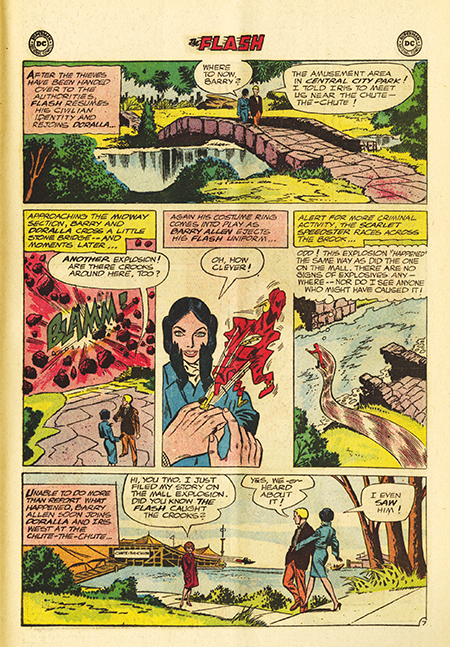 On the way to discovering that fact, the Flash and Doralla spend quite a bit of time walking around Central City which allows Carmine Infantino to draw some gorgeous city scapes loosely based on his native New York City’s Central Park. It’s this sort of artwork that separated this book from its contemporaries and made you want to try to create something like that yourself the next time your school had a snow day.